Among combat veterans there is a long tradition of owning the gun they went to war with. This accounts for the success of the M-16 after Vietnam and the AR-15 after tours of duty in the middle east. 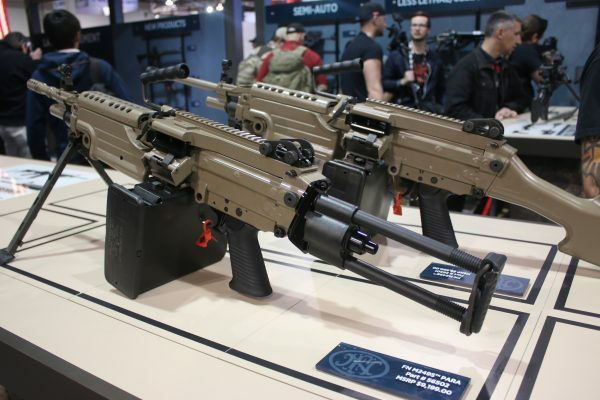 Now you can add FN America’s M249 PARA light machine gun to the mix. For the first time, veterans can personally own a civilian version of the Squad Automatic Weapon (SAW). Originally intended for airborne warrier, the M249 PARA offers a semi-automatic version of one of the world’s most battle-proven firearms. FN America unveiled the new M249S Para at SHOT Show 2017 with much fanfare among the gun press. This closed-bolt semi-automatic rifle keeps will feel just like the gun so many warriors used in Iraq and Afghanistan right down to the belted ammunition. The gun weighs 17 pounds and includes a 16.1-inch barrel, flip-up feed tray and gas-piston system with telescoping and rotating buttstock. Firing belted 5.56 rounds, this weapon is expected to a premium item among collectors. Retailing between $8,800 and $9,200.